Because of the benefits of being an enrolled agent (EA), the EA designation is worth every penny you spend on it. But exactly how much are you going to have to spend? If you’d like to prepare your funds for the process of earning the EA, you need to know about all the enrolled agent fees and expenses. 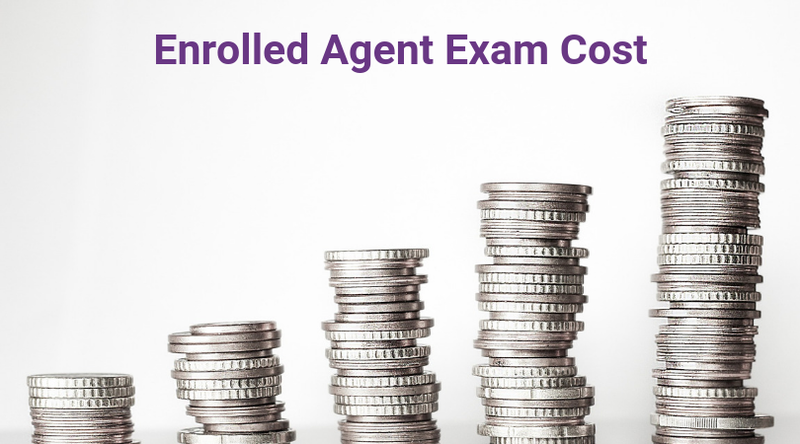 I’ll break down each Enrolled Agent exam cost and also reveal how you can save money on the EA. Prometric accepts MasterCard, Visa, American Express, and electronic checks. The Prometric website doesn’t specify whether debit cards are an acceptable form of payment, so you may want to call about using one. Additionally, Prometric does not accept money orders, personal checks, or cash. And, the Enrolled Agent testing fee is non-refundable and non-transferable. There are many different enrolled agent courses available for a variety of prices. The most popular one, Gleim EA Review, costs $500 – $600. However, this course covers all 3 exam parts. While you won’t pay as much initially if you purchase your EA review course by exam part, you save money in the long run when you buy a complete course for all 3 exam parts. Once you pass the exam and are ready to become an EA, you must pay $30 to the IRS in order to complete the enrollment process. You’ll pay the fee at the same time that you submit a form (Form 23), and you must do both within 1 year of passing all 3 parts of the EA exam. First, the IRS requires that you pay a licensing fee after you pass the EA exam. Additionally, you’ll need to attend continuing education (CE) seminars or sign up for online CE courses to keep your designation active. On average, the cost for these expenses is typically no more than $200-300 per year. The NAEA opposed the fee hike but was only able to negotiate for a slightly lower fee. Furthermore, with such a large increase, I don’t expect another spike in EA exam costs any time soon. Overall, you can expect to invest around $1,100 in the process of taking the EA exam, paying for the EA license, and maintaining your EA status with CE courses. As you can see, this enrolled agent fee schedule doesn’t account for the additional testing fees you would have to pay to retake a failed exam part. Nor does it include the $35 you must cover if you reschedule your testing appointment 5-29 calendar days before the appointment date. Therefore, you should keep these fees in mind as you are making your budget, studying for the exam, and scheduling your testing appointment. That way, you’ll be prepared to adjust for them if necessary in the future. Along with passing each exam part on your first attempt, you can also save on EA review courses with my exclusive discounts. If you’re able to sit for each part only once and use one of the discounts offered by the EA course providers, you can save hundreds of dollars! To find the best EA exam prep for you, check out my enrolled agent courses comparison. You can also get answers to your EA exam questions at my enrolled agent blog. Only credit card is accepted for the exam scheduling fee? I’ve personally sworn off credit cards for myself. What about a Visa debit card? Hi CJ, I check the latest info and Prometric now accepts MasterCard, Visa, American Express and Electronic checks. It doesn’t specify whether debit cards are ok but sounds like it’s fine. Money orders, paper checks and cash are not accepted as payment method. I will update the post. Thank you!